(NaturalNews) Spinach, in all its varieties, is one of the most nutritious "regular" foods in existence. One only needs to look at its bright, vibrant leaves to understand that this annual flowering plant, which is native to central and southwestern Asia, is brimming with all the essential nutrients that the body needs for maintenance and growth. 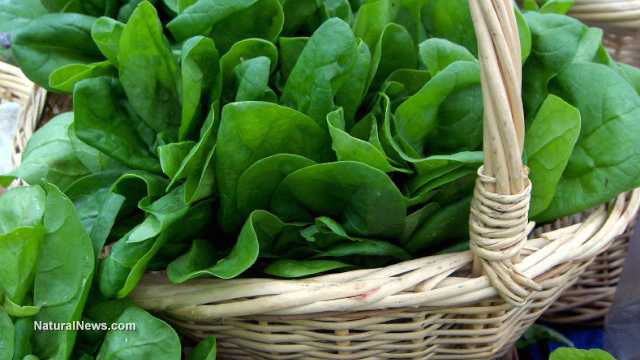 This article takes a closer look at the health benefits of spinach. Most of these benefits relate to cooked spinach, since spinach is a rare example of a vegetable that actually becomes more nutritious when it is boiled or steamed. This is because the cooking process helps break down spinach's large levels of oxalic acid, a natural acid that is known to hinder the absorption rate of several nutrients present in the vegetable like calcium and iron. One cup of cooked spinach also contains 6.4 milligrams of iron, which is 36 percent of the RDI. An essential macromineral, iron is widely known for its role in hemoglobin formation, but it also helps maintain brain, endocrine, metabolic and immune function. Iron-rich whole foods like spinach are, of course, much better sources of the mineral than synthetic tablets. The darker the leaves of the spinach plant, the more iron it contains. Certain carotenoids found in spinach, such as lutein and zeaxanthin, are macular pigments that are proven to help treat deteriorating eyesight. Research compiled by the Macular Society shows that lutein and zeaxanthin function as antioxidants in the macula, helping to destroy any free radicals in it. (5) Since free radicals are a primary cause of macular degeneration, eating more leafy green vegetables like spinach, which are the best natural sources of carotenoids, will directly benefit one's long-term eye health. Cooked spinach is also rich in vitamins C and E, folate, calcium, magnesium, potassium and manganese. Deficiencies in some of these essential minerals, most notably magnesium, are even more common than iron deficiencies. Eating more spinach and other leafy green vegetables like kale and broccoli, though, can correct many of the deficiencies that can compromise one's standard of living.